In theory, Americans and their government unreservedly support democratic movements. In practice, however, they worry about democratic alternatives to long-standing dictatorships. Sure, America is pro-democracy; but US interests come first. And while Arab dictators are certainly corrupt and oppressive, they do maintain regional stability. Along these lines, Western coverage of the latest resistance to Arab autocracies is quite revealing in its targeting of the Muslim Brotherhood, which poses the main opposition to many sitting regimes in the Middle East (Leinken). From the American perspective, all Islamists, including the Brotherhood, engage in terrorism and extremism. This wrongheaded view, which sees the Muslim Brotherhood as part of an Islamist monolith, not only inflates the potential threat from the organization but hampers U.S. foreign policy in the region. One way to observe the public’s anxiety about the Muslim Brotherhood is by means of a recent addition to Google’s search service, known as autocomplete. This once-experimental feature attempts to guess what a person is typing, displaying suggestions directly under the search box. Guesses are based entirely on the popularity of search terms typed by previous Google users. Autocomplete objectively captures the broad political thoughts and mood of an enormous amount of people. Type in Muslim brotherhood and a very telling list of predictions appear—a sequence that includes “terrorism, Iran, and Al-Qaeda,” none of which have positive connotations in the West. These “guess” items indicate the spoken and unspoken fears transmitted by the media to the mass public. It seems that anything containing the words Muslim or Islam in the post-9/11 era is subject to immediate scrutiny for connections to the more negative aspects of Islam and the Middle East. Yet, the Brotherhood’s background is an exemplar of religious moderation. Formed in 1928 as a resistance movement to British occupation in Egypt, the organization slowly transitioned into a religiously oriented political party. Principle to its beliefs is the idea of the umma, meaning ‘community,’ being the source of sulta, translated as ‘political authority’ (Leinken). As can be seen, this moderate vocation is a synonym for democracy. Even on issues such as homosexuality, sexual liberty, and drug use, the Brotherhood has indicated that it will respect the authority of the Egyptian people over the authority of religion (Hill). Indeed, it actively supports charitable actions, political involvement, and extensive education programs to combat religiously inspired violence and extremism. Such beliefs are a far cry from the “religious extremist” label that the contemporary Western media invariably pins on all Islamists. Rumors of extremism in such groups are, for the most part, falsely created, often by the ruling autocratic regimes themselves. According to Lionel Beehner, a Fellow at the Truman National Security Project, threats of extremism are “used by autocrats to safeguard their positions.” For dictators, two principle purposes are served by exaggerating the threats of radical Islam. First, their regimes often acquire additional foreign aid from the United States, enabling them to ramp up their military and internal policing powers (Lionel). Second, autocrats exaggerate or falsely create internal threats to delegitimize opposition groups and, thereby, consolidate their domestic political power. The Muslim Brotherhood in Egypt is a prime example of this unfortunate dynamic. After the assassination of his predecessor at the hands of radical Islamists, Egyptian leader Mubarak, in need of support from some religious groups to combat extremism in his country, attempted to form an alliance with the Brotherhood because of its moderate stances. The Brotherhood’s growing political power eventually led to its undoing, however. After gaining more seats in the Egyptian parliament than all other opposition groups combined, the group proceeded to criticize government actions as un-Islamic. Using the rise of Islamic militant group activity in the early 1990’s as a pretext, Mubarak called the Brotherhood an organization of fanatics, banned it from fielding candidates, and executed many of its leading members (Stilt). Despite the false label and the transparently self-serving political motives that generated it, the organization is still commonly associated with radicalism. Unfortunately, the United States, desperate for allies in the Middle East, is shooting itself in the foot by failing to recognize nuances in Islamism. Literally, Islamism is defined as “an Islamic revivalist movement, often characterized by moral conservatism” (Islamism). This broad definition allows for beliefs that often complement, rather than contradict, US interests. In the case of the Muslim Brotherhood, America is losing a possible strategic ally—one that represents at its core the antithesis of the extremism that the US is fighting. Indeed, Al Qaeda’s Ayman Zawahiri himself once exclaimed that the Brotherhood “lures thousands of young Muslim men into lines for elections…instead of into the lines of jihad” (Leiken). The Brotherhood espouses the liberal values of an open, civil, and democratic society. How else can one explain the group’s support for the secular politician, Mohamed El-Baradei? America policies cannot succeed in the Middle East unless they engage powerful Islamic influences in the area; and, though often forgotten, both governments created by the United States in the region are Islamic republics. It is, therefore, imperative that the American people, the US government, and the Western media start to distinguish the Brotherhood and, more generally, moderate Islam, from radical Islam. The Muslim Brotherhood—enemy of our enemy—is, after all, our natural friend. Autocomplete : Features – Web Search Help.” Google. Web. 04 Feb. 2011. Beehner, Lionel. “In Egypt, ‘Islamist’ fears overblown.” USA Today n.d.: Academic Search Complete. EBSCO. Web. 6 Feb. 2011. Google. Web. 06 Feb. 2011. Hill, Evan. 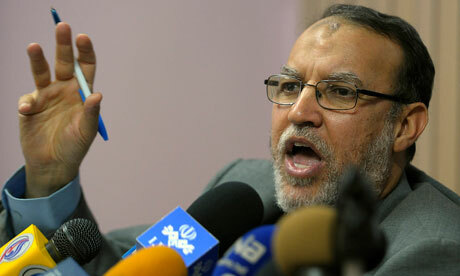 “The Muslim Brotherhood in Flux – In Depth – Al Jazeera English.” AJE – Al Jazeera English. 21 Nov. 2010. Web. 06 Feb. 2011. “Islamism – Definition of Islamism by the Free Online Dictionary, Thesaurus and Encyclopedia.” Dictionary, Encyclopedia and Thesaurus – The Free Dictionary. Web. 07 Feb. 2011. Leiken, Robert S., and Steven Brooke. “The Moderate Muslim Brotherhood.” Foreign Affairs 86.2 (2007): 107-121. Academic Search Alumni Edition. EBSCO. Web. 6 Feb. 2011. Masoud, Tarek. “What Is Egypt’s Muslim Brotherhood? : NPR.” Interview by Steve Inskeep.NPR : National Public Radio : News & Analysis, World, US, Music & Arts : NPR. National Public Radio, 1 Feb. 2011. Web. 06 Feb. 2011.